Dr Wheatgrass Highlights of the match: The maximum over long on by Neel. On a hot sunny day at Sano 1 having lost the toss Sharks captain, Neel and his troops were sent in to field while being a player short but aided with Kavin’s presence at 12th man who would keep wickets for 40 overs. Neel opened the attack with a fiery spell as the Tigers were left no choice but carefully leave balls or defend their wickets. From the other end Atharva continued the attack with some bounce of the pitch trying to force some mistakes on the Tiger’s part. The first breakthrough came off Atharva’s bowling as batsman Shriwasthava had run out of his luck and edged one too hard towards the safe hands of Neel at gully ( B Kulkarni C Date). The first spell ended with 4 overs from both Atharva and Neel when the batsmen were now a little more settled and getting looser with their shots. Sankar was brought into the attack and promptly delivered by bowling the opposition captain Chugh (B Prodhan) out. The sharks looked in good shape as the Tigers were 48-2 after 9 overs. Nick continued the attack from the other end by baiting batsman into their shots, however unluckily even the mistimed airborne shots landed in gaps. Soon enough as the ball got older Shark spinners Molloy and KB were brought into attack as the combination put the opposition in uncomfortable areas, yet again getting caught riding their luck as a few airborne shots just found the gaps and boundaries. However, the unplayable leg spin bowled by Molloy yielded the big hitting batsman, Karautiya, in a perfect set up as Nick caught one hit straight at him at long off (B Molloy, C Richardson). Once again Sankar was brought into the attack and promptly delivered as KB took a perfect catch to remove Anil Kumar (B Prodhan C Bayne), having lost a few quick wickets the Tigers were once again stranded at 105-4. Tactics of the Sharks saw no success as a partnership was built on in the grueling heat as the Tiger’s kept piling on runs and kept the scoreboard ticking. Koji came in to the attack and to the rescue of the Sharks as Cheesy took a perfect catch to remove the remaining opener and break a 100-run partnership which sparked some life into the Sharks. The Tigers were 217-5 at this point and the Sharks were determined to clean the innings up. The fired up Sharks picked another one as Neel caught Sachin Thakur plumb in front of the stumps in the death (lbw Date). However, runs kept leaking as the Sharks ended on a few loose overs where the Tigers capitalized to setting a mammoth total of 301-6, largely aided by a classy century by Thakur who ended with 114 unbeaten. With a tough ask of 302 to win , the Sharks openers Sankar and Neel set out with the intent to play smart and leave smarter. While beautifully leaving a few balls and playing the necessary ones, Sankar fell to a swinging ball as it hit his pads and was given lbw (lbw Kumar). Sharks were 4-1 and the Tigers were fired up as the ball was swinging and they looked to pick more wickets. While having reiterated the game plan to respect the bowling and leave good balls, Atharva and Neel looked to get rid of the nerves as they played out the swinging ball and the chatty Tigers without too much trouble. After getting a couple of boundaries, Atharva fell to an unfortunate incident as while walking towards his batting partner for a quick chat he was cunningly stumped by the Tigers. This fueled the Tiger’s bowling attack even more as the Sharks were 16-2 when Anton stepped up to the crease. Steadying the ship with beautiful drives, and concentrated batting Anton and Neel piled on runs as they had played out the swinging ball and now were stroking the Tiger’s bowlers at ease for plenty of runs. Having played wonderful shots, Anton accidentally nudged one up straight into the air as the bowler made no mistake taking the catch, as a wonderfully played 30 by Anton came to an end ( c & b Keloth). This also put an end to a good 75 run partnership which had put Sharks in a good position at 91-3. Chris Molloy joined Neel at the crease as he was now in full touch as he put on a display of cricketing shots and needed support at the other end which Molloy provided in the best possible fashion. Molloy and Neel continued to play wonderful shots and frustrated the Tigers as they showed grit and fight and illustrated that the game was not over just yet. However, while attempting to push the run rate Molloy nudged one right towards a fielder ( B Kumar C Srivastava) which ended a 60 run partnership as the Sharks found themselves at 155-4 with the skipper still out there. Terry joined Neel on the pitch with his textbook defense as the Sharks looked to play out at least 32 overs to avoid conceding a bonus point. However Terry fell to a similar set up as he also nudged it towards a fielder ( B Kumar C Srivastava). Cheesy joined Neel at the crease who was now looking very comfortable in his mid-60s determined to get his team past the 32nd over. Unfortunately, Cheesy fell to a delivery headed straight to the stumps (B Kumar). KB joined Neel while both steadily put the Sharks past the 32nd over. At this point Neel put the pedal on the gas as he looked to take apart the Tiger’s by putting forth a magnificent display of shots. The Sharks witnessed the Dr Wheatgrass highlight of the match as Neel smashed one over long on while showcasing one of cricket’s most beautiful shots for a maximum. 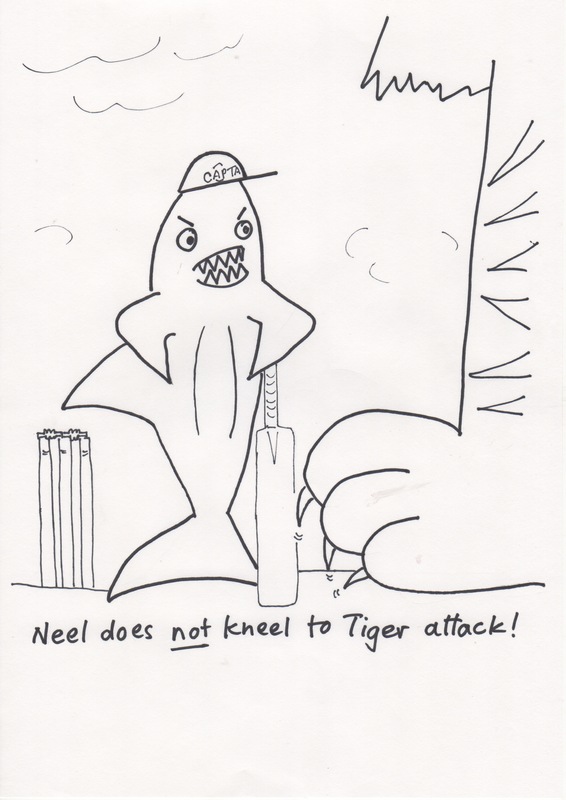 However the Tigers found their rhythm and were able to stump Neel after a magnificent inning (B Pooyath) . The Sharks were now at 197-7 , when Koji joined KB at the crease looking to play out the 40 overs. Wickets fell in quick succession as KB and later Nick were bowled by Pooyath in the same over, bringing the end of the Shark’s innings at 200-9. Although the Sharks faced a crushing defeat by a 101 runs, there were many positives to be taken from the game. The glaring takeaway from the match was Neel’s unforgettable knock of 88 which will be remembered by everyone who was there for a long time. The team together appreciated the camaraderie that everyone had shown through the stretch of the match, and were once again motivated by the post-match talks to fight harder for the rest of the season.